Over the past three years, Bishop Briggs has emerged as a talented singer/songwriter who combines a powerful singing voice with unique, personal songs. She merges pop, alternative and electronic styles to forge her own sound, and an excellent collection of her songs can be heard on her debut album Church of Scars, that was released in April on Island Records. Church of Scars is a 10-song album that includes her recent single “White Flag,” which is a positive, empowering song about overcoming obstacles and not giving up. Other new songs on the album are “Hallowed Ground,” a haunting, propulsive song that contains the title “church of scars,” and “Water,” a soulful ballad that features multi-layered vocals in the chorus. The album also includes two of Bishop’s most popular songs that were previously released as singles. “Wild Horses” was her debut track in 2015, and it helped launch her career, reaching #1 on Spotify’s U.S. Viral Chart. Then “River” was released in 2016, and it became her best known song to date. The single was an alternative and rock hit on the Billboard charts, and has been certified gold by the RIAA. Bishop was born in London to Scottish parents, and she mostly grew up in Japan and Hong Kong. After graduating from high school, she moved to Los Angeles, where she attended college at the Musician’s Institute, and ahe eventually built her reputation as a promising artist to watch. In addition to the songs on her album Church of Scars, Bishop is also excited about a new single she has just released called “Baby.” She says that “Baby” and her song “Water” are indicative of the new music that she’s creating. 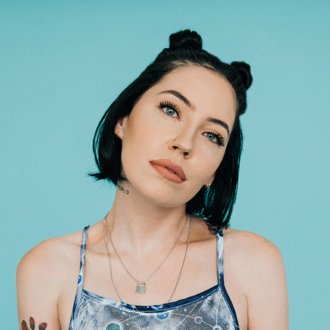 We are pleased to do this new Q&A interview with Bishop Briggs. She discusses her album, some of her key songs, and her songwriting process. DK: I like your new album, Church of Scars. Can you talk about the making of this album? Bishop Briggs: It’s my first album, so I really wanted to make sure that it represented that time of my life. The final song added to the album is called “Water,” and I felt it was a hint or a taste of the music that I’m making now. I also wanted to show the beginning of the journey, which was “River,” and where I am now. Hopefully, I’ve grown and evolved in some ways. But I think with writing, I always just want to become more and more transparent. DK: On your album, you’ve included your early songs “River” and “Wild Horses.” Did you want to give fans a full picture of where you started and what your new music is? Briggs: Yeah, it felt important to have those songs on there, because those were the songs…they’re the reason that I could even make the album. So it felt important to have the start of the journey in there too. DK: I like your song “White Flag,” which has a strong, determined message. What inspired you to write this song? Briggs: Thank you. It has meant so much to have heard people’s stories while I’ve been on the road, about what that song means to them. The song began from a place of not giving up, despite any obstacles that are in your way. It felt important to release something that would hopefully make others feels as empowered as I felt in the process of writing it. DK: Another key song on your album is “Hallowed Ground,” and you sing your title “church of scars” in it. Can you talk about this song and the meaning of Church of Scars? Briggs: Yes, the album title came from that song. There was a lyric in “Hallowed Ground” that says, “My heart is a church of scars,” and it seemed like the perfect representation of how I felt during the recording process. [It was] really opening myself up, and kind of allowing all of the wounds to be there. “Hallowed Ground” was a song that was written while I was on tour, and it was about having a safe space that is around you that makes you feel protected. I think sometimes when you’re meeting a lot of different people and you are having some things asked of you, it’s important to have that inner peace surrounding yourself. And I think that’s how you kind of stay close to the ground, and that’s how “Hallowed Ground” began. Briggs: I’m really excited about this song, because it is lighter than other songs that I have put out. I wrote it a couple months ago, and I felt like it needed to be released as a single. It’s about the importance of fully loving yourself, and therefore you can love someone else, and that’s flaws and all. It’s definitely a very cheeky song, it’s a very sweet song, and I just can’t wait for everyone to hear it. DK: In addition to your songwriting, I really like your singing voice, which can be powerful and soulful. How did you develop your vocal style? Briggs: Thank you. I was hugely inspired by Aretha Franklin, Etta James, and as I got older, I got really into Janis Joplin. I think with those as your singing idols, it becomes your goal to sing with passion and sing as much truth as you can. And I think all of them were storytellers first, and you felt the emotions through their singing and through their words. So it was always a goal of mine to have that transparency every time I sang. DK: On your album, you co-wrote several songs with Ian Scott & Mark Jackson, including “River” and “Wild Horses.” Can you talk about your collaboration with them? DK: On your album, you also wrote songs with Dan Reynolds of Imagine Dragons and Dan Wilson (Grammy-winning hit songwriter for Adele and Dixie Chicks). How did you connect with them to write with? Briggs: Oh my gosh, it’s crazy (laughs). I think those were (writing) opportunities that I had to really completely be present for, because I was in awe that they were even happening. Both writers are extremely iconic. I had to try my best to just hold on to my seat basically (laughs). DK: You’re currently on tour as a headliner. Can you talk about your new tour and show? Briggs: I’m in the middle of it. I finished a six-month long tour, and I’ve been in L.A. for a few weeks just writing. Then I’ll be back on the road at the end of August. I love performing so much…being able to connect with the people in front of me. It’s something that I live off of, and it truly makes me feel so alive.